The Scheduled Tasks feature (MIDAS Admin Options → Manage MIDAS → Scheduled Tasks) allows your MIDAS system to automatically send your clients reminders of their upcoming bookings, invoice payment reminders, and invoice overdue notifications, based on a schedule you set. 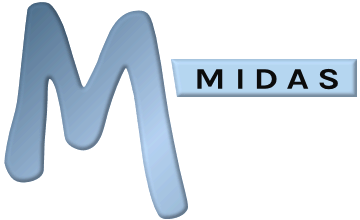 In order for the Scheduled Tasks component of MIDAS to correctly function, you will need to setup a CRON job (or equivalent) on your server to execute the "cron.pl" file in your MIDAS installation once every per hour. The "Last Run" time provides an indication of when Scheduled Task were last run and can be used to verify your CRON job is running correctly. To have MIDAS send booking reminders to clients in advance of their bookings taking place, tick the "Send clients reminders of their upcoming bookings around X hours before they start" option, and set X to the number of hours before a booking starts that a reminder should be sent to a client. For example, if X is set to "6", and a client's booking is due to start at 2.30pm, MIDAS will send them a reminder between 8am-9am the same morning (6 hours earlier). By default, invoices created within MIDAS are not automatically sent to clients, and must be actioned by a user with sufficient privileges accordingly. However, with the "Send any unsent invoices" option selected on the Scheduled Tasks screen, once per day, MIDAS will check for any invoices that are unsent, and send them automatically to clients. Once an invoice has been "sent" (by which we mean it has either been printed out/emailed to the client manually, or automatically emailed to the client through a scheduled task), MIDAS can then send an automated invoice reminder to the client prior to the date their invoices are due. To enable such reminders, tick the "Send payment reminders to clients X days before an unpaid invoice is due" option, and set X to the number of days before an unpaid invoice is due that a reminder should be sent to the client. For example, if X is set to "5", and an unpaid invoice is due on 15 April, MIDAS will send the client a reminder of their unpaid invoice on 10 April. To have MIDAS send a payment overdue notification to a client if their invoice hasn't been paid within the "Payment Terms" time frame (You'll find this setting on the Invoicing tab of the Manage MIDAS screen), tick the "Send payment overdue notifications to clients X days after an unpaid invoice was due" option, and set X to the number of days after an unpaid invoice was due that a notification should be sent to the client. For example, if X is set to "5", and full payment for an invoice was due on or before 15 April, MIDAS will send the client a notification of their overdue invoice on 20 April.